If you've ever signed even one Change.org petition, you've probably had 100 more arrive in your inbox, hat in hand. "Would you like to make the world a better place?" they say, with a deference that's almost too quiet to hear. Which made us wonder if a tiny sans serif font really has it what it takes to engender change. But, one anti-fur petition just proved us wrong. People are listening. 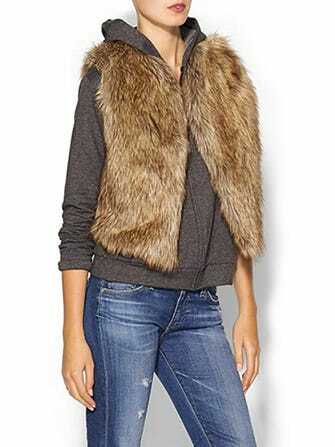 For instance: The people at Gap Inc. who have promised to remove all fur products from its subsidiary, Piperlime. This comes after Piperlime was called out in a Change.org petition created by Sarah Maddux of Williamsburg, VA, earlier this month. She saw a Facebook ad for Piperlime and learned that it was selling rabbit and fox fur. Maddux immediately reached out to the company, which responded that it prohibits "the use of angora and real fur in products designed by or manufactured for Gap Inc. brands." This works for Gap, Old Navy, and Banana Republic, where everything is produced by the brand itself (not to mention safely ensconced at a price point that makes real fur a non-issue), but Piperlime sells items made by other brands, many of which are high-end designers. Within two weeks, Maddux amassed 52,000 signatures, and Gap responded on Change.org yesterday. “Your opinions and views matter to us," wrote Debbie Mesloh, Gap Inc.'s senior director of public affairs. "That is why, effective immediately, Piperlime will no longer sell real fur products, whether they are made by our company or not. This is an expansion beyond our existing policy of prohibiting real fur in our branded products." A smart move by Gap to do this while people are only petitioning. If there's ever an Orwellian-style uprising, these asks will probably get a lot less nice. Because nobody assembles like bunnies. Nobody.